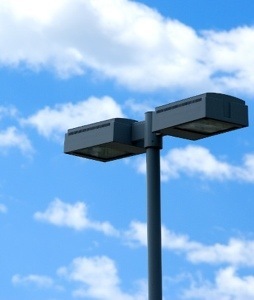 I was working one day in a gas station parking lot to repair some inoperative pole lights. We have various methods for working on these type of light fixtures. Depending on the height of the pole, we usually rent some sort of a motorized lift. In this particular case, the poles were not very high, so I decided to use my extension ladder to reach the light. This is not the safest way, so I wouldn’t recommend it. I tend to be a little adventurous at work and I try to complete the job as efficiently and with as little cost as possible. Lifts are expensive to rent. I climbed the ladder, removed the light fixture’s cover and began to work. It was a beautiful day filled with blue skies and white puffy clouds, and, as I was working, my eyes drifted to the clouds. As I watched the clouds pass by, I suddenly felt dizzy and began to loose my balance. My heart jumped into my throat as the thought of falling overwhelmed me. Then, I focused my eyes on the light. I was able to steady myself and regain my balance. It took focusing on a stable object to help me regain my footing. This world is an ever changing mixture of opinions and philosophies. Entire television shows are devoted to debating the latest political topics. Social media provides a stage for millions to voice their thoughts and opinions on every subject under the sun. The only certainty in this world is that nothing is for certain. Scientists, politicians, movies stars, and many others tell us how we must think and feel, and others say that there is no absolute truth. “If it feels good, do it.” “Love whoever you want to. ” “It’s a woman’s choice.” And on and on it goes. God said that His Word was forever settled in Heaven. That’s a comforting thought. It’s high time we got our eyes off the world and on the Word. Every day another Christian looses their balance and falls for the schemes of the world. We must not allow the passing clouds of opinion to catch our gaze. Is your world unstable today? Do you need to regain your footing? Turn your eyes upon Jesus and his eternal unchanging Word. This entry was posted in Uncategorized and tagged Christian, church, electrician by tdmannn. Bookmark the permalink.